Betelgeuse, duo consisting of Jose Antonio Serrano (Every No One / Noisome) y David Ortolà (Lontano / Factor City), mixes every music influence using huge palettes of different sounds and compositive techniques in a fundamental search for soundscapes and sensations which don’t leave anybody indifferent. After one track included in a spanish movie (“Dripping”, by Vicente Monsonís) and several cd-demos, excellent reviews for their works in a number of european music labels did come –amongst them Kitty-Yo (Berlin), Pork Recordings (New Yorkshire, UK), K2O (Kamzlerant, Berlin), Amgstrong (Toulousse, France), Expading (London) or spa.RK (Barcelona)–. These labels spoke with them about the chances of release them but eventually didn’t do because of the crisis of music sales. So then Betelgeuse opened their own label, Kontakte, along with Chelis, (Robot / El Megáfono), and released in 2006 “Kontakt” EP, maxisingle acclaimed by the reviews which also had a remix by Dj Rupture (Soot Records). Two of the most significant reactions were the election as fourth best spanish single of the year 2006 by the spanish top magazine Rockdelux, and to have been Top Single Recommendation at Warp’s website. 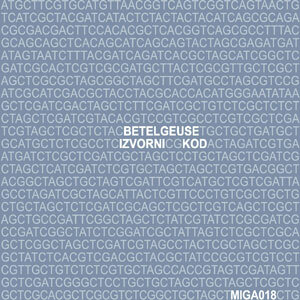 They have just released “Ivorni Kod” for the netlabel Miga. And in the next months we will be able to enjoy their first album: “Silencio”, for Kontakte, and a remix for Monoceros (Imaginary Nonexistant Records / Expading / spa.RK). Also in a experimental dance style, they have remixed “Más que una Bendición” for Fangoria (Subterfuge, 2003) and “Load Cassette”, for Aerobic Studio (Aerobic Studio, 2005). Their style has been tried to define as «collage pop of electronic abstraction» (“History of Rock in the Comunidad Valenciana”, Raül Serrador, Ed. AvantPress). Their live debut was at Electro 2m5 Festival in Zaragoza and have also played in the Observatori Festival, and in the venue Umbracle in the City of Science and Art in Valencia.